The system of recording important events pertaining to local history and the accounts of the village seems to have had its origin or a long time age. After the fall of Vijayanagar Empire its territories were captured by muslim rulers and then by the British East India Company (BEIC). The BEIC employed Col. Colin Mackenzie to survey South India. He became the Surveyor General of Madras in 1810. T.V. Mahalingam opined that Col. Colin Mackenzie was one of those pioneers, who would ever be remembered for of antiquities, particularly in the form of local historical documents relating to South India. Thus Col. Colin Mackenzie was responsible for the collection of a very large collection. Before going into the details of, it is necessary to write a brief introduction about Col. Colin Mackenzie. Mackenzie was born in Stornoway in 1753. His father was Murdoch Mackenzie who owned a fleet of ships to trade with Norway, France and Holland. Colin was an elder brother, by name Alexander, and an younger one Kenneth, besides a sister Mary. He did research under Lord Napier and took the oriental research seriously. Mackenzie came to Madras on 2 September, 1783, when Warren Hustings was the Governor General of India. In the same year he joined the military service as an Ensign Engineer. In 1789 he became a Major, in 1809 a Lieutenant Colonel and finally, in 1819 a Colone. In 1790 Mackenzie was entrusted with the work of survey of Guntur Circar. Till June 1793 he surveyed Cuddapah, Kurnool and the wild mountains of Nallamala and the Erramalais as far as the Krishna District. From 1794 he surveyed the frontier regions of Nizams territories between the Pennar and the Krishna rivers. In 1796 he submitted a detailed map of Nizam’s dominions. Mackenzie had also taken a great interest in minerals and spent a considerable time in that part of the country where diamond mines were situated. While in the service of East India Company, he toured throughout South India. In the course of such tours, he found several inscriptions. In fact at several places he noticed some unusual traces of ancient remains curiously. As a consequence, an idea struck to him together as much information as possible about these antiquarian remains which he considered to be of much value. He succeeded in securing the services of young talented men, Kavali Venkata Borriah, with the assistance of his two brothers Kavali Lakshmaiah and Kavali Ramaswami. This enabled him to successfully carryon the work in the coastal Andhra and the present Rayalaseema districts. These manuscripts came into being under the guidance of Col. Colin Mackenzie. Therefore they are called Mackenzie Manuscripts. These are generally known as Kaiffiyats. The Directors of the BEIC showered lavish praises on Mackenzie. The Manuscripts collected by Mackenzie are in Telugu, Tamil, Kannada and Malayalam languages. The largest number of them are in Telugu consisting 40 of the total, while Tamil and Malayalam manuscripts put together are about 35% and the rest are in Kannada. Though the manuscripts were in different languages of South India. Many of them do not confine to the language of the regions whose history they recorded. There are many Telugu manuscripts relating to the history of Tamil country and so are Tamil and Kannada manuscripts. The predominance of Telugu speaking people because of their migration to Tamil and Kannada areas during the time of Vijayanagara rulers. They wrote the history of those areas in their vernaculars. Mackenzie also depended upon the mother-tongue of the assistants working for him in these regions. The collection included as many as 1,568 manuscripts in Tamil, Telugu and Kannada. Of the thousands of local accounts, the largest number is in Telugu. These accounts are called pertaining to various topics like history of the land, biography, legendary and literary accounts of the time and of the past. Besides kaifiyyats, his collection also contained 8,076 inscriptions and other antiquities. The word Kaifiyyat is derived from the Arabic word Kaif. It is used in most other Indian languages with the same meaning. Kaifiyyat means a statement or Vaukmoolam or historical narration, particulars, tafseel. There are many kaifiyyats in Telugu. Those collected by Mackenzie are known as kaifiyyats. Many aspects of village life were described: i) the settlement of the village, ii) the period of settlement, iii) the location of surrounding villages, iv) the cultivable land, v) wet and dry land in the village, vi) irrigation facilities and vii) main crops kaifiyyats also throw light on various cultural groups and the period of rule of various dynasties, etc. these were arranged to be recorded by scribes, under the supervision of the village heads of karnams. Some kaifiyyats throw light on cultural, socio-economic, revenue and religious aspects of life. today Kaifiyyats are useful to know the history of the period after the downfall of Vijayanagar Empire and the beginning of the British rule in the 18th and 19th centuries. Historians consider kaifiyyat as important source of history for this period with the constraints of internal and external criticism so as to ascertain authenticity. Kaifiyyats contain information about a variety of life issues. The range of information was a very wide one. Different aspects of life are referred to in minute details. There was also information regarding the then existing gardens and tanks. Kaifiyyats gave the genealogy of rulers belonging to certain dynasties and in some cases these of village karanams. They are also a rich sources of social, religious and economic conditions of those days. They further give not only the information of agraharas maintained by the kings, but also about the temples existed at that time. The kaifiyyats represent a singular ‘mosaic’ of fact and fiction, puranic and legendary, ethical and philosophical, material and temporal. Enable the scholars and readers further studies and research. The Mackenzie manuscripts are like the veritable and expanding sea before the philosopher. The kaifiyyat is a happy blend of the historical and devotional aspects, welded and meshed into a detailed account. It is to be admitted that exaggerated notions regarding the value of the Mackenzie manuscripts as containing authentic historical material are not justified. They are not of the kind of final word. Several scholars of oriental research often admire Mackenzie. Still authenticity of the information contained in these has equally been doubted, however with reason, for these records are generally based on second hand and unverified narrations, inspite of the field of historical research. C.P. Brown complied English-Telugu Dictionary and Telugu-English Dictionary. Kaifiyyats were useful in compiling them. Kandukuri Veeresalingam in his work on Andhra Kavula Charitra used a number of kaifiyyats. T.V. Mahalingam edited the Mackenzie Manuscripts in two volumes. William Taylor published a few Mackenzie Manuscripts in the Madras Journal of Literature and Sciences. N elaturi Venkataramanayya in his work Cuddapah Inscriptions based on kaifiyyats studied various political, historical, financial and cultural aspects of Cuddapah district. In his other work The Studies of the Third of Dynasty of Vijayanagara relating to Kotakonda, Gandikota, Veldurthi Koduru, Koikuntla, Bukkapatanam, Sirivella, Nossam, Ontimitta were utilized. C. Veerabhadra Rao, K.V. Lakshmana Rao, Appa Rao, R. Subba Rao, M. Somasekhara Sarma, M.Rama Rao, V.Yasodadevi and others have freely used Mackenzie manuscripts while writing the history of Andhra Pradesh, P.V. PRabramaha Sastri wrote a foreword to Guntur kaifiyyats. Threat he mentioned about the singular importance of kaifiyyats in writing history. Thus some historically important kaifiyyats were already published by A.P. State Archives, Hyderabad. But, while writing the history of the Tirupati pilgrim Complex (TPC) a few of the Kaifiyyats were translated, as they are, from the Marathi records of the eighteenth and nineteenth centuries. They are published verbatim neither with a description nor with any analysis. So taking the kaifiyyats as a source for historical reconstruction of the history of Tirupati is suggested as a research topic by my research supervisor. About the TPC there is a lot of interesting information from the kaifiyyats. The regional and local history can be enriched by a study of the kaifiyyats. Broadly speaking, while studying the social and cultural aspects of localities, only a few kaifiyyats of certain villages are used. There are indeed many interesting historical aspects of villages and towns in Rayalaseema, i.e., Anantapuram, Cuddapah, Kurnool and Chittoor districts. There is no clear history fcr about a century and a half from the fall of Vijayanagar Empire. The present study deals with ten specific kaifiyyats about the Boundaries of Tirupati; the encroachments on Temple Estate by 1786-88 A.D; the 189 village owned by the TTD in 1801 A.D; an account or the village an the hands of the Inamdras (Fusly 1217) A.D.; the different people who annual visited TPC on pilgrimage by (1795); allowance for the daily and weekly offerings to the Lord of Tirumala by 1799-1800 A.D; the various Amuldars appointed by the Nawabs of Arcot upto 1800-1801 A.D; the roads leading to the Tirumala Temple by 1804-5 A.D; the daily ceremonies thereat Tirumala temple by Sri Venkateswara and the extraordinary ceremonies performed therein. So far there is no study has been made on Tirupati Kaifiyyats. Since these kaifiyyats are originally written, not in Telugu but in old Marathi script. 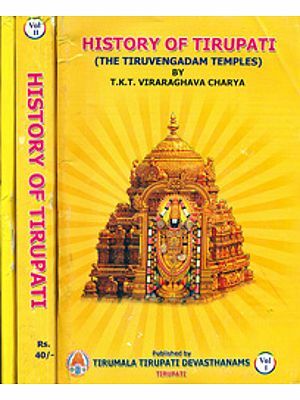 They were not integrated for a very long time into the history of Tirupati. The BErC had gained a lot from the kaifiyyats. Such vital information is integrated to general history of the TTD only very recently. The dissertation is divided into six units including the introduction and the Conclusions. The first chapter deals with the Kutb Shahi invasion of the Tirupati Pilgrim Complex in 1645 A.D. The second chapter is about the Conditions of the TPC under the Arcot Nawabs. The administration of Tirupati temple during English East Indian Company which was according to set rules. It deals with 187 villages owned by the Devasthanams in 1801 A.D. It also deals with villages in the hands of the in Fusly 1217. Different people other than Tirupati i.e. from various other places both in India and Abroad, who visited the TPC are listed. Finally within this Chapter, the various Amuldars appointed by the nawabs of Arcot, the French, the Mysore ruler and the British were listed. 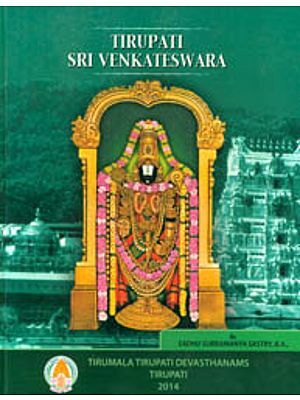 The third chapter is devoted to discuss about the Boundaries of Tirupati and the daily food obtained to SVS. The fourth chapter discusses the about the Yadast of the Puncha Moortee and Veshasha Oochavams. At the end is the unit on conclusions. 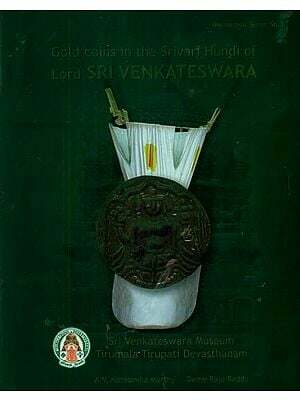 1 187 Villages owned by Devasthanam, 1801 A.D.
4 The institution of Amuldars of Tirupati 1210, 1800 - 1801 A.D.